The south polar vortex swirling in the atmosphere of Saturn's biggest moon, Titan, as seen in June 2012 by NASA's Cassini spacecraft. The mysteriously cold vortex of air whirling above the south pole of Saturn's moon Titan may result from its atmosphere's unique chemistry, a new study finds. This cold winter polar vortex — unlike anything seen on Earth, Venus or Mars — could shed light on how atmospheres behave on alien worlds, the researchers said. Before its fiery dive into Saturn's atmosphere on Sept. 15, NASA's Cassini probe scanned Titan's hazy, soupy atmosphere for nearly half of Titan's 29.5-Earth-year-long year. This helped mission team members analyze how Titan's nitrogen-methane atmosphere evolved during the winter and summer in both its northern and southern hemispheres. On Earth, Venus and Mars, hotspots usually form in the atmospheres high above the poles of their winter hemispheres. This is because sinking air there gets compressed and heated, similar to what happens in a bicycle pump, said study lead author Nicholas Teanby, a planetary scientist at the University of Bristol in England. Unexpectedly, in 2012, during the winter in the south of Titan, Cassini found that the vortex of air 185 miles (300 kilometers) above Titan's south pole rapidly became extraordinarily cold instead of hot — cool enough, in fact, for clouds of hydrogen cyanide ice to form. "We've been modeling the atmosphere of Titan for over two decades now, but none of the models predicted this cooling," Teanby told Space.com. "This has also not been observed on other terrestrial planets — Mars, Earth, Venus — so it was unexpected." Some heating was seen high in Titan's southern atmosphere at the very start of winter there in 2009. However, "it then quickly got surprisingly cold after a few years," with temperatures down to minus 243 degrees Fahrenheit (minus 153 degrees Celsius) seen there until 2015, "which is very cold, even for Titan's stratosphere," Teanby said. Titan's southern vortex, imaged by Cassini in July 2012. To find out what caused this surprising cooling, Teanby and his colleagues analyzed data Cassini gathered over the past 13 years. They focused on the chemistry and temperature of Titan's south polar winter vortex. The research team's findings suggested that trace gases that make up mere millionths of Titan's atmosphere may explain this unexpected cooling. "Previously, we thought these gases had quite a minor role, so this was a big surprise," Teanby said. Sunlight can trigger exotic chemical reactions high up in Titan's atmosphere, generating short-lived compounds such as ethane, acetylene, hydrogen cyanide and cyanoacetylene. These molecules absorb heat from Titan and radiate it out into outer space in the form of infrared rays, cooling it down. "Atmospheric circulation can move these gases around, concentrating them in certain locations, particularly the poles," Teanby said. 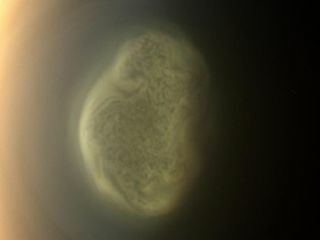 This cooling is apparently unique to Titan in the solar system because sunlight does not form major amounts of these atmospheric cooling trace gases high up in the atmospheres of other terrestrial worlds such as Earth, Mars and Venus, Teanby said. "Atmospheric chemistry is extremely important when considering the state of planets in our own solar system and beyond," Teanby said. "A similar effect could also be occurring in many exoplanet atmospheres, having implications for cloud formation and atmospheric dynamics." The scientists detailed their findings online today (Nov. 21) in the journal Nature Communications. Follow Charles Q. Choi on Twitter @cqchoi. Follow us @Spacedotcom, Facebook and Google+. Originally published on Space.com.